The device is equipped with GPU Turbo technology that is claimed to help boost performance, lower power consumption, and enhances picture quality. The mobile also claims to be 2x more stable while gaming. The smartphone comes with 7.1-channel Histen sound and 3D game sound effects, which produces superb sound quality. Its camera is another attractive specification which houses dual camera at rear with dual AF and AI scene recognition that can identify 22 different categories and over 500 scenes. The Honor Play is launched in India. The phone features a large 6.3-inch notched full-screen IPS LCD display with 1080 x 2340 Full HD+ resolution, 19:9 aspect ratio, with 85 percent NTSC color gamut. It is powered by an octa-core 10nm Kirin 970 chipset with a dedicated NPU to power the AI features. It is clubbed with Mali-G72 MP12 GPU, 4/6GB RAM, and 64GB default storage. The storage can be expanded up to 256GB via microSD card. The GPU Turbo technology present on board is claimed to help boost performance, lower power consumption, and enhances picture quality. The mobile also claims to be 2x more stable while gaming. The smartphone also comes with 7.1-channel Histen sound and 3D game sound effects. In terms of optics, the Honor Play houses a 16MP(f/2.2) + 2MP(f/2.4) dual-lens camera system with dual AF and AI scene recognition that can identify 22 different categories and over 500 scenes. On the front is a 16MP(f/2.0) selfie camera with AI portrait feature. The smartphone also supports 3D portrait lighting. The connectivity aspects on board the unit include wifi 802.11 a/b/g/n/ac, wifi direct, hotspot, v4.2, BLE, 2.0 USB Type-C, with A-GPS, GLONASS, BDS, and dual sim. It packs a non-removable Li-Po 3750 mAh capacity battery with fast charging support which can provide up to 1.5 days of usage even for heavy users. In terms of software, the Honor Play will be the company’s first product to ship with the Android 8.1(Oreo)-based EMUI 8.2 out of the box. Sensors present on board include a fingerprint sensor, accelerometer, proximity, compass, ambient light sensor, gyroscope and gravity sensor. The smartphone is available in Indian market in Black, Blue and Violet colors. 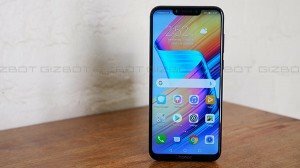 The Honor Play is priced at Rs. 21,000 for 4/64GB variant and Rs. 25,100 for 6/64GB variant. .